1. Camouflage, as practiced in the present war, is a new development, which has been carried to a high point of efficiency and value, particularly by the French. 2. It embraces, at present, not only the concealment of everything used in military operations -- trenches, gun emplacements, military trains, machines of all sorts, observation points, even horses and men (snipers) -- but in making dummy trenches, gun emplacements, bridges, etc. 3. It is of great value to conceal from observation any of the materiel of war, but this value is greatly increased if we, at the same time, can furnish the enemy with a dummy target concealed just enough to be discovered. For example, if the enemy ascertains the fire is coming from a concealed battery he will continue to observe and thoroughly search the terrain, while if in the immediate vicinity dummy guns and emplacements are partially concealed and fire simulated with smoke bombs, the chances for the life of the battery are greatly increased. 4. At first concealment was secured by the employment of natural materials at hand, such as branches of trees, foliage, grass, etc., and in many cases these are the most effectual temporary means of concealment. 5. Direct painting of the objects to be concealed was next adopted. (c) Destroying identity by breaking up the form of the object, using large, bold patches of color, such as green, cream, and brown, with black definitions between each color. Objects should be split up into a number of dissociated pieces. Always paint an object dark on top, light underneath. This destroys the effect of shadow. Never stop pattern on an edge, but continue over it. 7. The breaking up of form is of more importance than color, as the eye searches for that which is familiar in form, and is apt to pass over a shape entirely different from that for which it is looking. 8. There is not much use in painting objects to harmonize with surroundings unless a long stay in the neighborhood is expected. A skilled artist is needed for painting in broken tones, but the destroying identity can be done by almost anyone. (c) Strips of painted canvas on wire netting. (a) Canvas should always be sloped (at least 30º) over raised objects to eliminate shadow. Must cover every particle of earthwork marks, materials used while working, etc. Should be supported throughout, otherwise flapping will shake all color out and rip canvas. Straight lines should be broken up. (b) At present the supply of raffia is exhausted and there seems to be no likelihood of obtaining more. Substitutes being tried are shredded palmetto leaves, Florida moss. The leaves of the ordinary cattail would seem to be good if obtainable locally. These materials are tied into wire netting (ordinarily chicken wire), and if about 60 to 70 per cent of the surface is covered the results are satisfactory. (c) Colored canvas strips about 10 inches by 3/4 inch knotted on wire netting are an excellent substitute for raffia; bunches of hay or grass lightly painted may be used. Materials (such as branches, bunches of hay, canvas strips, Florida moss, etc., supplemented with local vegetation) that will stir in a breeze are better than a solid screen of canvas or strips closely woven in mesh. 10. (Concealment from observation from aeroplanes is most important, but horizontal concealment is of distinct value. 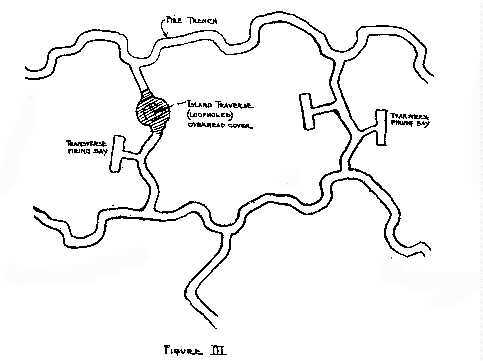 For example, even if an aeroplane photograph of a trench position has been taken and maps therefrom made and supplied to the first enemy line; the trench lines may be so constructed and concealed that it is almost impossible to identify them on the ground from the map, or to observe the effects of fire. Under these circumstances it is more than likely that visible dummy trenches will draw the fire. 11. If positions are so concealed that aeroplane observations and photos do not disclose them, it is obvious that enemy artillery fire is at a great disadvantage. 12. Guns and gun emplacements may be effectually concealed by any of the above-mentioned means. 13. It is, however, impossible to keep the tracks leading to the position concealed, as they are constantly being used. 14. It has been found most effective to continue the tracks beyond the position and in several directions. l5. It is wise to insist that vehicles arriving at positions at night should always go beyond the position, thus keeping the tracks fresh, and at the ends of these tracks to install dummy guns or emplacements. 16. An arrangement for simulating gunfire at these points by means of smoke bombs is of great value. 17. A canvas covering the gun or emplacement, painted to represent the tracks, continued directly over the emplacement, is sometimes used. 18. Matting must be laid on the ground under and in front of the gun to prevent dust being raised by the blast of discharge and the position of the gun indicated thereby. 19. Road screens of different types are in use. Roads are often covered, both at the sides and overhead, with painted canvas or wire mesh, effectually preventing areoplane plane observation during movements of troops or trains. This covering sometimes extends for several miles. 20. In the case where a road leading to the rear is under observation from an opposite height, screens have been erected across the road, painted with a continuation of the road and surrounding scenery in perspective, behind which movements take place without observation. 21. In other cases it has been found more effective to place canvas screens en echelon, at varying angles, which so break up the view that observation is almost impossible. 22. This latter method is useful where a skilled artist is not available for the scene painting. 23. It has been stated in the present war that concealment is of no value, owing to the fact that trenches are now so near together. As a matter of fact the principles of concealment are of even greater importance than before, now that trenches are only a few yards apart. If concealment is of no value then the converse applies, visibility is no detriment, and if visibility is no detriment, there is no reason why the parapet of a trench should not be as well defined as the top of a wall. If this is the ease, it does not take much ingenuity of the enemy to fix their rifles and machine guns in such a way that they can sweep the top of the parapet from end to end, even at night. They can fire at night almost as accurately as during the day, and every time the parapet is manned there is likelihood hood of a considerable number of casualties. 24. The great thing is to confuse them as to the exact line of your parapet. 25. 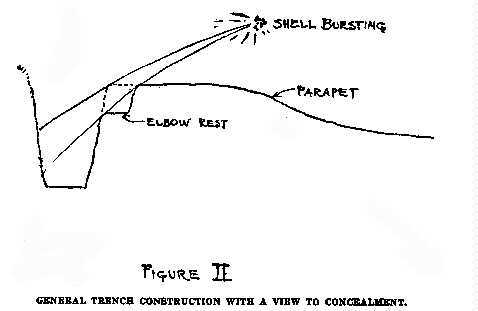 If you can only make them think that the top of the parados is the top of the parapet you will have done something, and if you construct your trenches in wavy line, both vertically and horizontally irregular, instead of in straight lines, the artillery will not be able to get the range with the same amount of accuracy, and this will help to lessen your casualties. 26. In the case of deliberate intrenchment when you are awaiting the attack of the enemy, it is hardly necessary to emphasize the importance of concealment. 27. There is nothing more likely to shatter the morale of a body of soldiers than being suddenly fired on from a concealed position. There was a case in the present war when the trenches of a battalion were so well concealed that although their presence was discovered by the enemy and they were the object of his fire for two or three hours, their exact position was never ascertained, and not one casualty was inflicted. The enemy attacked in close formation and were allowed to approach within 50 yards before fire was opened. They became entangled in wire and attempted to get away, but, before they could get to cover, their demoralization by surprise was such that ultimately 4,000 dead Germans were counted in front of the position. In the case of deliberate intrenchment, whatever the class of country may be, it is always possible to hide trenches from the air, and from the ground it can be done to such an extent that the enemy might almost fall into them without seeing them, and in most kinds of soil they can be constructed without much greater expenditure of time, labor, or material than is necessary in making existing trenches. In most soils ten minutes extra labor is sufficient for the purpose. It is almost entirely a question of thought and experience and not of labor. 29. It is of the utmost importance to avoid straight lines and angles, but there should not be a lack of method in trench construction. 30. An unusual combination is needed, the combination of untidiness and irregularity of the exterior of the trench with the most scrupulous exactness and neatness of the interior. 31. The parapet of the trench should absolutely harmonize with the appearance of its surroundings and every raised portion of the trench should be indistinguishable from a natural contour. This is of as much or even more importance than the assimilation of color to the foreground. 32. Of course every raised portion of the trench should similate the color of the foreground. In grassland the sods should be replaced; in cultivated land crops should be replaced; in ploughed land the top soil, which is invariably a different color from the subsoil, should be scraped to the rear and replaced on the parapet after digging is completed. 33. It is a very simple matter to do this in ploughed land. Shovel the first 6 inches of soil to the rear, then throw up the parapet in an irregular, uneven manner, and when the digging is completed shovel the 6 inches of soil that has been placed to the rear over the parapet. 34. 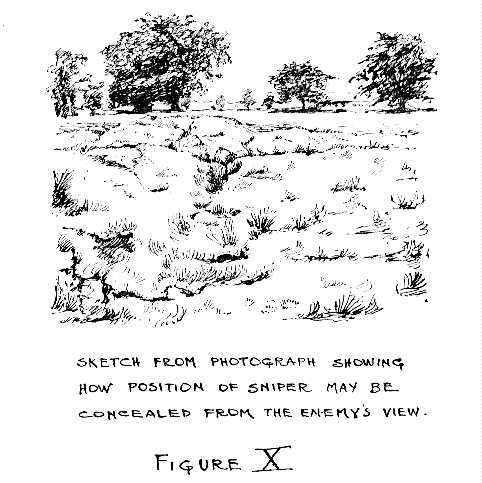 Concealment from aircraft is more difficult, but it must be remembered that artillery observers find it extremely difficult to recognize from descriptions or photographs of air scouts targets consisting of skillfully concealed positions. 35. 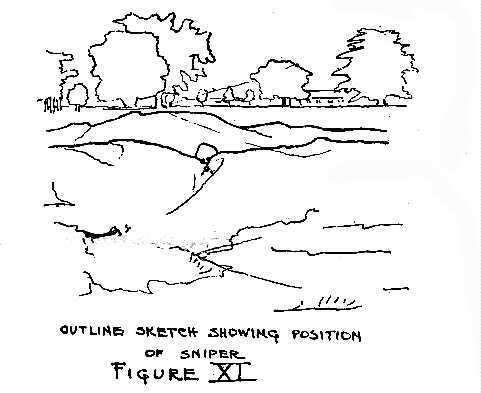 It has been found that positions concealed from ground observation are also much less visible from aeroplane observation, and that straight lines and angles are much more visible to aircraft observers than irregular natural looking curves. 36. A trench so constructed is easily mistaken for a natural dip in the ground, and this is particularly true if the men have strict orders to crouch in the bottom of the trench when aeroplanes are flying over. Much can be done to neutralize the value of aeroplane photos, namely, the use of dummies, overhead cover of some sort such as netting or chicken wire threaded with grass or fiber, sitting trenches in the line of hedges, so that the shadow thrown by the hedge prevents the trench from being spotted from above. In chalk country the black shadow of the trench is very marked between the white parapet and parados, but in almost every instance there is a layer of several inches of dark soil which should be removed and afterwards spread over the parapet and parados, leaving the white chalk to show in the sides and bottom of the trench, thus breaking up the dark shadow. Trenches in chalk country can be successfully rendered inconspicuous to aeroplane observation in this way. 37. 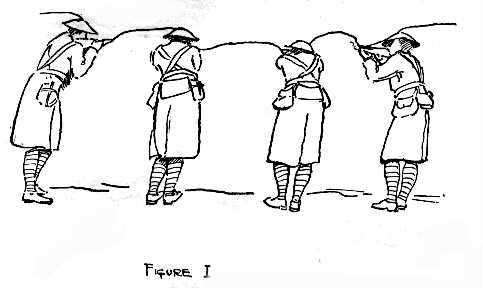 In addition to concealing trenches, it is advisable to conceal the heads of men firing from them. This can be done partly by special construction of the parapet and partly by making the men's heads harmonize in color with the parapet. If the top of the parapet is made in irregular curves, this is much easier. 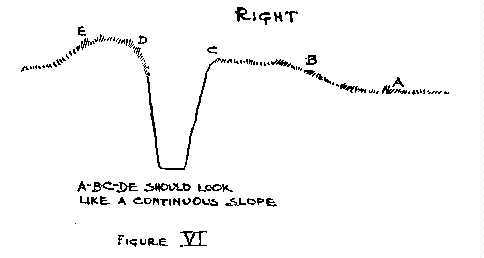 As a general rule, the top of the trench is made in an absolutely straight line like the top of a wall, but if it is made in irregular waves, as shown in the sketch (Fig. I), the man then looks around the corner of cover and his head merges with the raised portion of the parapet and is not easily seen. In the Boer War the Boers always looked around a rock instead of looking over it, to the great loss of the English. in addition to having a wavy parapet, care should be taken that there is always a background of some sort, and if there is no natural background, the parados should be high enough to form one. 39. The head should be made to harmonize with the foreground. The simplest form of mask is an ordinary sandbag with holes cut for the eyes and corners stitched down so as not to be too prominent. (Figs. X, XI, and XII.) In grassland it should be covered with grass; near an earth parapet, with earth. A good amount of concealment is afforded by smearing the face and helmet with mud. making the parapet as irregular as possible and covering it with the top soil or sods. The enemy in the morning find they have a very bad target in front of them instead of a very conspicuous one, and they also find it impossible to spot men's heads as they fire over the parapet. 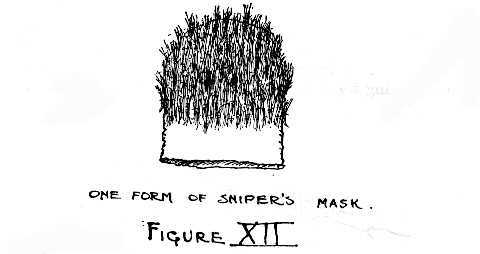 what an easy matter it is to expose one's head over the parapet without being seen we should have much greater confidence, and our snipers would show much greater activity and cause many more casualties in the ranks of the enemy. 42. Elbow rests have been practically abandoned in the trenches at this time. Shrapnel bursts downward and forward. It is therefore obvious that the steeper the upper portion of the interior slope is, the more it is protected from shrapnel. (Fig. II.) By constructing an irregular parapet, as shown in Figure I, there is no need of a continuous elbow rest. which may be rendered extremely inconspicuous, not only the general lines but the traverses themselves tending to blend into natural appearing contours. This style of sitting will not interfere in the slightest degree with strategical design, nor with problems of cover or drainage. 46. In siting a trench it is of the utmost importance that you should lie on your face to see that there is a field of fire in the immediate foreground. It is difficult or even impossible to site a trench otherwise. It can not be done from horseback. 47. The wavy type of trench has many advantages -- it is easy to conceal, as curves have a much more natural appearance than straight lines and angles. It can be utilized much more readily for obtaining oblique fire and it can be constructed in such a way that it gives more adequate protection against enfilade fire and also enables you to get a greater number of rifles in the trench than any other type. The construction of a simple fire trench in grassland, before widening and deepening for continued occupancy, is as follows (Fig. IV). inches wide. Next a 3-foot width of sod is removed both in front and rear of the line of trench. All the sods are piled 10 yards to the rear of the trench, grass to grass and earth to earth, to prevent soiling. Some of the men can now commence excavating and throwing up soil to form the parapet. While they are doing this a few men should pare a further 3 feet of sod in front as shown. Where there is sufficient fiber it should be turned back, not rolled, ready to replace at the front the finished parapet. would fall into without seeing it. It is not necessary to sod the parapet with neatness and regularity, the whole thing can be done perfectly easily by any soldier who can handle a pick and shovel. The parapet should be irregular and have a natural appearance. 50. 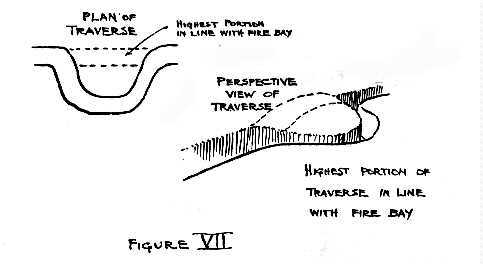 Traverses are best made with rounded corners so as to give a natural appearance from the air and also to allow a man to pass around more readily. traverse shows op from the flanks and sometimes even from the front. 52. It is strange that barb wire is furnished galvanized; it was originally so made to prevent rusting, and to be more visible. It is more conspicuous and expensive. 53. Wood ports are difficult to conceal; the screw iron post is inconspicuous and noiseless in placing. 54. Plain iron bars 1 by 3/8 inch, pointed end turned flat side toward the enemy, are effective; and if painted with splashes of color are almost invisible at 50 yards. In many part of France where wood is scarce they would be cheaper. time it is only necessary to replace the sods along the line A, B.
sandbags are turned out in several places, it is impossible to spot loopholes even with field glasses. 57. The main thing in all concealment of trenches is to simulate the following lines of nature, and happily this irregularity is easier to attain than perfectly straight and regular lines.